High school students from around the province are getting ready to do battle next month... but don't worry, they won't be duking it out with each other! They're building robots to do the dirty work for them. It's part of what is called the F.I.R.S.T Robotics competition. 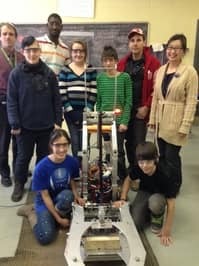 Our Eastern Townships reporter Alison Brunette visited the workshop at Richmond Regional High School where a group of students have been building their robot.